Liverpool FC has been given permission to increase Anfield's capacity from about 45,500 to about 59,000 as part of a £100m expansion plan. 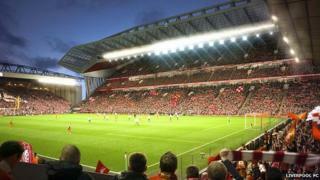 Liverpool City Council's planning committee approved the club's proposal to expand the Main Stand by 8,300 seats and the Anfield Road Stand by 4,800. Construction will begin next year for completion by the 2016-17 season. But objectors to the expansion said the Premier League club had "selfishly blighted" the area. Liverpool's proposals, which would see the Main Stand be expanded from one to three tiers, also include additional conference and banqueting facilities, a new club shop and more car parking. The expansion is part of a wider £260m regeneration of the Anfield area of the city. The planning application states the redevelopment would allow the club to host major international fixtures and European finals. It said there are parts of the stadium that currently "fall below current Uefa and Premier League standards, which restrict the club's ability" to host major games. Uefa insist upon a minimum 50,000 capacity stadium, corporate accommodation and a minimum standard for players and match officials' changing rooms. A memorial to the 96 Liverpool fans who died in the 1989 Hillsborough disaster will be moved to form part of the Hillsborough Memorial Garden. But Anfield resident Gary Jones told BBC Radio Merseyside: "The parking situation is a nightmare around here on matchday. So 15,000 [sic] more people is going to make it more of a nightmare than it already is." And some businesses and hoteliers argued closing Anfield Road to redevelop the stadium will "take money away from local traders" and clog Walton Breck Road. Mike Butler from the Anfield Regeneration Action Committee said: "The Anfield area is not a business estate for Liverpool Football Club." He added that the plans were "one concerted attack after another" on residents living near the stadium. Mayor of Liverpool Joe Anderson said: "This is a very important milestone in our ambitions to transform the Anfield area, bringing new jobs, investment and housing. "Liverpool FC's proposals for the stadium are a key part of this." About 250 new homes would be built, 296 would be removed, and a 100-bed hotel constructed under the proposals. Last year, a consultation with residents in the area showed more than 80% supported the plans that have been drawn up by a consortium made up of Liverpool City Council, housing providers and Liverpool FC. Liverpool FC was founded at Anfield Road in 1892 and originally consisted of small stands at the Anfield Road and Walton Breck Road ends.